The hallucinatory imagery is reflected in the book’s cover art, “Black and White Man with Fetus,” by Alicia Caudle. A man in a black suit has a fetus for a head, carrying another fetus in his hand, his suit’s only marking an armband made of text. The image is a strange mashup of Boschian nightmare and Max Beckmann-esque Expressionist dread. The book of poetry is large sized yet only a little over fifty pages long, making it look and feel like a high quality magazine, some lost pagan relic turned afterlife samizdat. 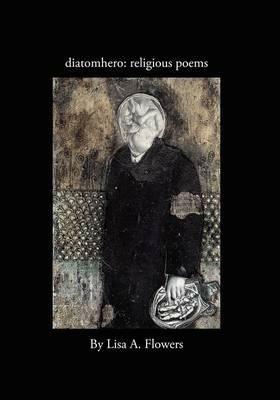 Flowers, who founded Vulgar Marsala Press, published diatomhero. Vulgar Marsala’s mission statement involves the releasing of poetry that “seeks to facilitate the internal bleeding of poetry into arthouse cinema, visual art, classical music, and any number of other mediums.” Like The Book of Knowledge, by Chad Faries, another Vulgar Marsala poetry collection, this is poetry that struggles to break the bonds of the Language Poets and other academically-oriented groups. This poetry bleeds, cries, and rages. In less than fifty pages, Flowers has transported us into multiple realms, riding the waves of the collective unconscious and the disjecta of pop culture, folklore, and classic cinema. The poetry here tells us about her struggle with unnamed, undefined traumatic events. Is it the job of the critic to divine what these events were? What was the specific impetus for the creation of this poetry? In this case, no. Sometimes the enigmas shouldn’t be explained. The explanations would empty the poetry of its pregnant meanings. Not everything needs to be measured, weighed, and evaluated under the dictatorial-rationalist gaze of Urizen.